The Government of Cornhusker Boys State is poised to begin active service after a year of recess. Returning from the previous session is Governor Ruben Aguilar, a graduate of Lincoln North Star High School. Joining him will be the newest delegation of the Cornhusker Boys State Legislature, who will soon begin to campaign in each of their individual towns. Together, they will debate, pass, and ultimately sign a plethora of new legislation into the law books of this great state. Many groups from all across the state will be looking to pass legislation on a number of issues. These issues range from the death penalty to the legalization of marijuana, to the manner in which Boys Staters are tucked into bed each night. The Death Penalty is poised to be a object of large contention at this years Boys State. After a November ballot measure overturned the previous ban of the practice legislators on both sides of the issue will seek to address this issue. The argument in many cases boils down to public safety for many supporters of the action. They argue that the death penalty is needed to punish the most heinous of crimes, as well as provide further punishment while in prison to protect the safety of prison guards, especially after the prison riots that have taken place in the Nebraska prison system. Detractors argue that the death penalty does not actually work to stop people from committing these crimes, and that life in prison is an adequate sentence in almost every case. Another key issue is the scarcity of the lethal injection drugs needed to execute a sentence. The legalization of marijuana is a debate that has begun in almost every state across the country. States like Colorado and Washington, among others have legalized recreational marijuana while even more have legalized just medical marijuana. The argument for this proposition rest mainly on the personal liberties of the citizens of the state. They argue that the state should not put people in prison for using a drug that does little to actively hurt anyone else, especially when drugs like alcohol are widely abused and legal. They opposition show the negative affects that marijuana has on the brain, especially in those still developing. The societal affects, they argue, far outweigh the threat to liberty argued by the supporters. Lastly, the legislature looks set to debate the “nighty-night” bill once again. This landmark piece of legislation will shape the way that the Boys Staters interact with their counselors for the entire week. The act of tucking each Boys Stater into bed will create a lasting sense of community and ensure that not Boys Staters are engaged in any kind of illicit nocturnal activities. The opposition to this legislation again rests in the debate of personal liberties, as some argue it is a breach of privacy. 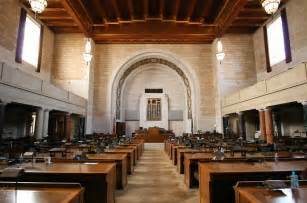 In the end, the Cornhusker Boys State government will elect legislators to debate these key issues. The democratic process that is at the bedrock of our nation will work to solve the issues between the citizens of our state and the legislature will vote to pass meaningful legislation.